Spoilage during storage is a concern when soybean moisture levels are high. If storage temperatures are below about 60°F, soybeans at 13% moisture can usually be kept for about 6 months without having mold problems. As moisture levels increase, however, the length of time soybeans can safely be stored decreases. As a general guideline, soybeans in storage in Minnesota tend to act about the same as corn that is 2 points greater in moisture content. For example, soybeans at 16% moisture can be expected to act like corn at 18% moisture. Grain temperature and moisture greatly impact the length of time grain can safely be stored, also known as the Allowable Storage Time. For example, soybeans at 18% moisture and 50°F, the Allowable Storage Time is about 63 days, while soybeans at the same moisture content but at 40°F have an Allowable Storage Time of about 142 days. 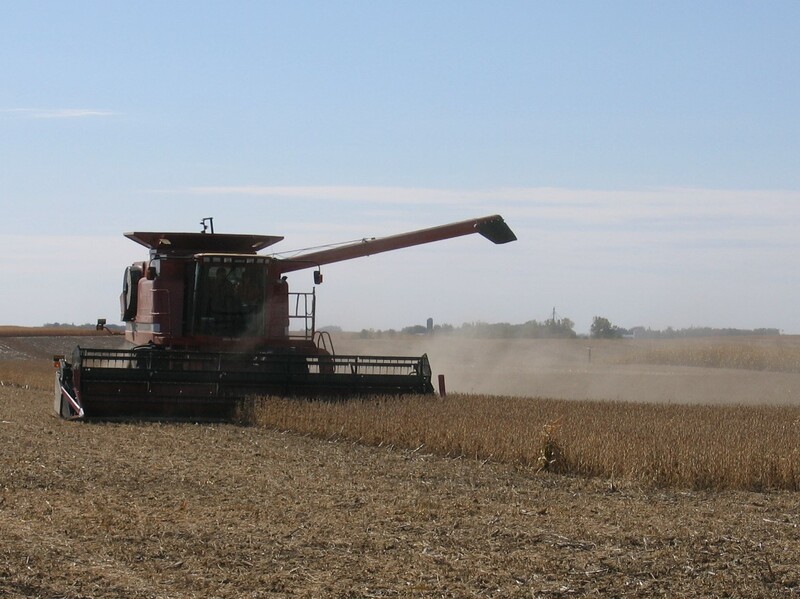 For soybeans at a moisture content of 16%, the Allowable Storage Time is approximately 128 days at 50°F, which increases to approximately 288 days at 40°F. For further details, see the article “Storing, Drying, and Handling Wet Soybeans”. Note safe allowable storage times are cumulative, meaning that if half of the safe storage life is used up when soybeans are wet, only half of the safe storage life will remain at a lower moisture content. Note, aeration is always recommended with all storage facilities to control heating or other storage problems. Artificial drying of soybeans will be needed if soybeans are harvested and stored at a moisture content greater than 13%. Natural-air drying can work in southern Minnesota until about December 1, but the amount of drying that can occur in late October through November is limited. Many of the principles for natural-air drying of corn will be similar for drying soybeans (details available at: https://extension.umn.edu/corn-harvest/natural-air-corn-drying). Supplemental heat can decease drying times, but caution is advised since soybeans can be damaged by high temperatures and rough handling. Iowa State University recommends limiting air temperature to 100-110F for seed beans and no more than 130°F to 140°F for commercial soybeans. See “Soybean Drying and Storage” for more details. Again, extreme caution must be exerted when using artificial drying with soybeans. Damage to soybeans has been reported at drying temperatures as low as 130°F. For more detailed advice on the drying of soybean, refer to the article “NDSU Offers Soybean Drying Advice” by Dr. Kenneth Hellevang of North Dakota State University.